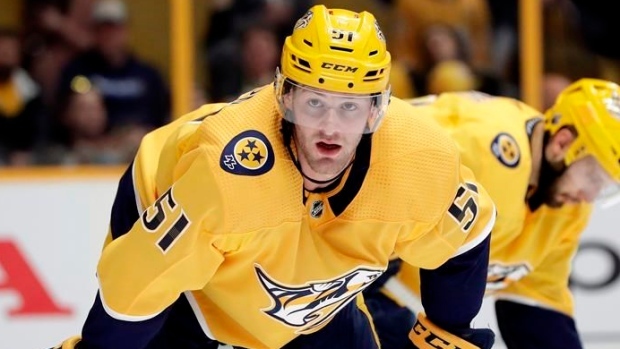 NASHVILLE — Austin Watson's girlfriend is taking blame for the incident that led the NHL to suspend the Nashville Predators' forward for 27 games, a punishment reduced to 18 games by an arbitrator on appeal. "My behaviour and state of intoxication lead to the police being involved that day," Guardino said. "I have struggled with alcoholism for many years and I am actively involved in AA. I am fortunate to have Austin's continued support with my treatment. We handled matters poorly on June 16th and know that we need to make better decisions going forward." He can have the misdemeanour charge dismissed by fulfilling terms of his judicial diversion program. Watson must serve three months of probation and complete both an in-patient treatment program and a batterer's intervention program.